Commission on the Status of Women 2015: Here's Your Chance - Gertrude Mongella to speak at CSW Forum! Here's Your Chance - Gertrude Mongella to speak at CSW Forum! 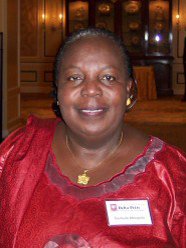 Dr. Gertrude Mongella, former UN Secretary General of the Fourth World Conference on Women to speak on Consultation Day 8 March during the NGO CSW Forum 2015. Dr. Gertrude Mongella, former UN Secretary General of the UN Fourth World Conference on Women in Beijing will give a special address at the NGO CSW/NY Consultation Day (8 March 2015 at the Apollo Theatre). In 2004, she became the first woman President of the Pan African Parliament. She was awarded the U. of Georgia Delta Prize for Global Understanding and an honorary PhD from Ewha Womans University in Seoul. Consultation Day will open with songs from Mexico, Denmark, Kenya and China performed by the “Women of the World” singers. Speakers include Ruchira Gupta, this year’s Woman of Distinction Awardee, Phumzile Mlambo-Ngcuka, UN Under-Secretary General and Executive Director of UN Women, NGO leaders and youth activists.